My family and I enjoyed staying here. The room was clean and comfortable. I felt like the bed in the room was really comfortable and enjoyed it so much. I didn't want to get out of it in the morning. The breakfast and complimentary coffee throughout the day. The breakfast was good. It was optimal. You can get all the basic things. It was very crowded but the staff tries to bring more stuff right after they finish. The beds are soo comfortable and the rooms are pretty clean. I had some issues with my reservation and the were great and very helpful... The main manager were great, so do all staff.. Close to airport, very easy going.. The breakfast was better than expected but it could be a little better with some cheese and cold cuts added. The Mexican restaurant staff and atmosphere was great. Even though I didn't need services for the airport, it is conveniently located near the airport. Also, when we first got there, the gentleman that checked me in was very nice. The beds were comfortable and a nice number of pillows. The large flat TV with many channels. The morning and daytime staff were very helpful and added a ray of sunshine to my stay. Hotel very close to several restaurants. 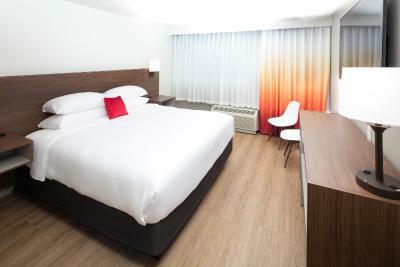 Red Lion Hotel Atlanta Airport This rating is a reflection of how the property compares to the industry standard when it comes to price, facilities and services available. It's based on a self-evaluation by the property. Use this rating to help choose your stay! One of our best sellers in Atlanta! Free shuttle services to the Atlanta Airport and College Park MARTA Station are provided at this smoke-free College Park Atlanta Red Lion Hotel. Extras include an outdoor pool, free breakfast, and a 24-hour fitness center. Free WiFi, a 55-inch flat-screen TV, and desk are featured in every room. Plus, guests can enjoy a desk, private bathroom, and air conditioning. Guests can use the meeting rooms and laundry facilities at the hotel. La Fiesta restaurant is on site and parking is provided for a fee. The Landings at Princeton Lakes shopping and dining area is 5.6 mi from this property, while Georgia State University is 8.5 mi away. Fort McPherson is 11 minutes' away by car. 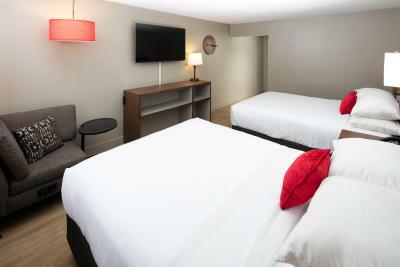 When would you like to stay at Red Lion Hotel Atlanta Airport? This room includes a 55-inch flat-screen TV and desk. Extras include a hairdryer, toiletries, and ironing facilities. This room includes a 55-inch flat-screen TV and desk. The accessible features are bathroom handrails, lever door handles, and Braille room numbers as well as a roll-in shower, lowered closet rail with shelves, and a door peephole. This room includes a 55-inch flat-screen TV and desk. The accessible features are bathroom handrails, lever door handles, and Braille room numbers as well as a lowered closet rail, shelves, and a door peephole. Our newly renovated hotel rooms provide guests an ideal hotel near Atlanta Airport to relax after a long trip or refocus on work for an upcoming meeting. We offer some of the best accommodations at an Atlanta, GA airport hotel including pillow-top mattresses, deluxe amenities, and flat screen televisions.Guests enjoy comfort & convenience at our business-friendly Atlanta airport hotel with well-lit desks in each room, complimentary Wi-Fi, exercise facility and more. House Rules Red Lion Hotel Atlanta Airport takes special requests – add in the next step! Red Lion Hotel Atlanta Airport accepts these cards and reserves the right to temporarily hold an amount prior to arrival. Airport shuttle hours are limited. Contact the hotel for availability. The staff was very rude and unprofessional. When i arrive one the employees was outside laughing and talking to some guys.Then the other employee behind the counter had a little girl there with her. The hotel was just really ghetto alot of people wondering the halls.Me and my girls felt unsafe.They did not have me sign any paperwork upon checking in and they charge me a extra fee that i was unaware of; supposedly for accidentals.. I did enjoy the location and the lobby..
Bathroom sink water took forever to drain. Toilet had to be flushed several times for water to go down. No food at breakfast. No meats to go along with food. The breakfast offering was a bit limited, however the waffle maker was a novel experience. Difficulty finding out how to get the airport transfer from the airport to the hotel when we arrived. We ended up having to pay for a taxi. Good location, close enough to the airport with an airport shuttle service included. Some fast food restaurants nearby. Rooms are very spacious and comfortable. The shuttle form the airport must be taken from the domestic terminal only, so if you arrive from an international flight you must change terminals. This is not displayed anywhere. The mattresswas a brand name with new memory foam top - it was the most comfortable hotel bed my friend and I had ever slept in!! The free airport shuttle (round the clock) made this hotel convenient and very good value - I would certainly stay again! I had informed the hotel in my reservation notes that I was surprising my husband for his birthday and wanted it to be special but upon arrival, the room and bathroom were dirty! Also, I had to call the front desk 3 times in a 4 hour period to bring us new towels. Needless to say, they never brought them and we had to use dirty towels for the remainder of our stay. The food options could have been better.